I love soup in general--I'd be hard pressed to ever pick a favorite. I think I could live on soup. But to me, this particular soup is nothing short of miraculous when I need it most. It soothes my tummy on days when nothing else sounds good, and when I'm feeling worn down and icky. I don't know what ingredient gives me the most comfort--maybe it's the just-tender-enough bites of cabbage and rice, or the zing of lemon, or the tang of nutritional yeast. I don't know what it is about this soup (probably all the goodness combined), but when I'm feeling a little beat-up, or achey, or not in the mood to eat much of anything, a hot mug of miracle soup hits the spot. There are days I simply crave this soup-- sick or not! Awhile ago on my Facebook page I mentioned my "Triple Threat". I bring out the triple threat whenever I start getting those dreaded symptoms of a looming monster cold--aches, pains, sore throat, and just in general feeling like I've been hit by a small truck. Fire cider (click her for a great recipe) is the first player in the triple threat, and though I've become a believer in its healing properties, I have to admit, it burns a little going down. To tame the tingle, I eat a spoonful of honey, and then enjoy a cup of miracle soup. I then spend the next hour or so sipping on herbal tea. I repeat this for as long as I need to, usually several days, but I feel better the very first day. In my opinion, nutritional yeast is what makes this soup tick. Nutritional yeast is used in many vegetarian and vegan recipes to add a cheesy, umami kick, or in this case, a soothing tangy broth. If you've never had it, you must try. It can be found at any health food store in the bulk section, it's relatively inexpensive, and it offers a boost of nutrition, mostly in the form of vitamin B12. I've found that nutritional yeast is cause for some debate, however. As an advocate for real, whole foods, I figured I had better do a little research. It turns out, the research is murky and there are some alarming rumors about nutritional yeast that don't seem to be based on solid studies. I'm not by any means a medical professional or a holistic guru, but here is my take on it: I think that we all have an inner voice that lets us know when a food is not helping our bodies (like the way I feel when I eat too much gluten--a topic for a future post in the works). If nooch (a cutesy name for nutritional yeast) gives you any negative reactive feelings, then by all means avoid it. This article addresses nutritional yeast and explains some of the myths surrounding it. *Note: Don't be alarmed if your pee turns bright, bright yellow after eating the nooch version of this soup. It's okay! It's just the extra water-soluble riboflavin being released. It means you are getting plenty of those B vitamins and riboflavin that your body needs, and releasing the extra is not harmful to your body at all. Don't overcook this soup. This is important. Follow the times in the recipe even though it seems like it couldn't possibly have cooked long enough. While I do freeze individual portions to have on hand if the need for it suddenly arises, the soup is best fresh. Every couple months or so I make a pot of it to keep in the fridge, dipping bowls of it out to warm up for a snack, light lunch, or breakfast. Once you freeze it, the texture of the rice changes slightly, but it's still wonderfully effective. *I adapted this recipe from this obscure book I found at my public library. (affiliate link). I really like using the teas from Traditional Medicinals in my 'triple threat'. This variety pack includes Breathe Easy, Throat Coat, Echinacea Plus, and Gypsy Cold Care. Love them all! In a soup pot over medium heat, saute onions, cabbage, garlic and spices in oil for 8-10 minutes. Stir frequently and if the veggies start to brown or stick, turn heat to medium-low. Do not overcook--the cabbage should have a bit of crisp left in it. Add remaining ingredients and bring to a boil; lower heat and simmer for 10 minutes. Eat the soup hot out of a mug. 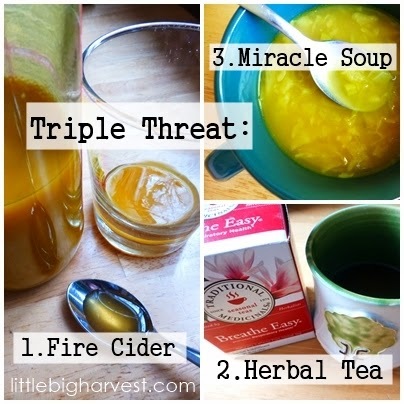 Take with fire cider and herbal tea to help chase away the cold-season ickies. Tastes best the next day. Make a batch of miracle soup and keep in the fridge when you feel a minor illness coming on, and eat a mug of it each day. Or, freeze in 1-cup portions for those times you need it. *Try using cooked quinoa instead of rice. *Try substituting kale for part or all of the cabbage. *Gently whisk a tablespoon of miso into your cup of soup to make it super-charged with immunity boosters! I hope you try it! I have a few things that I use nutritional yeast in, including an awesome cheeseless nacho cheese. :) Thank you for your comment! This sounds great. Although its a 100 degrees in LA this week, I'm going to try this recipe this weekend. I love tumeric, garlic and lemon combinations. Thank you.